Myriam Gendron - Bric-à-brac by Mama Bird Recording Co.
Little things that no one needs — Little things to joke about — Little landscapes, done in beads. Little morals, woven out, Little wreaths of gilded grass, Little brigs of whittled oak Bottled painfully in glass; These are made by lonely folk. Lonely folk have lines of days Long and faltering and thin; Therefore — little wax bouquets, Prayers cut upon a pin, Little maps of pinkish lands, Little charts of curly seas, Little plats of linen strands, Little verses, such as these. © & ℗ 2014 Mama Bird Recording Co. under license from Myriam Gendron. 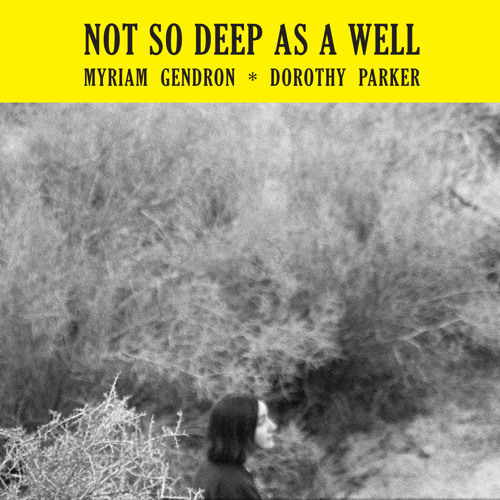 © 2014 Myriam Gendron, SOCAN Lyrics by Dorothy Parker. The composers wishes to thank the National Association for the Advancement of Colored People for authorizing the use of Dorothy Parker's works.